Seats which nest together are common in schools, auditoria etc. Today’s invention extends that to vehicles. 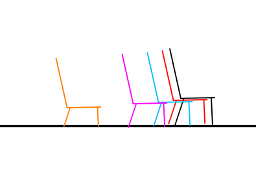 Imagine a plane or a bus or even a domestic people mover in which all the back seats can move forwards or backwards on rails (I’d like them motorised). The seat parts would be horizontal and set at slightly lower heights towards the rear of the vehicle. This would allow for much more flexible loading of people and/or luggage, without the need to remove seats. It would also enable seat spacing to be programmable, depending on the needs of a particular journey. Shorter people could opt to sit at the rear, so that their feet could reach the ground more easily.